Story: John Patrick Shanley brings his Pulitzer Prize and Tony Award winning play to the screen as a gripping story about the quest for truth, the forces of change, and the devastating consequences of blind justice in an age defined by moral conviction. It's 1964, St. Nicholas in the Bronx. 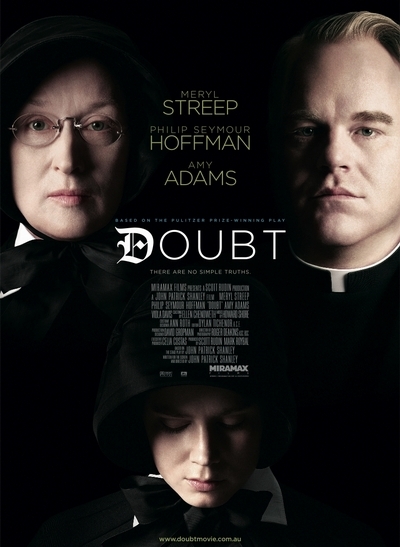 A vibrant, charismatic priest, Father Flynn (Academy Award winner Philip Seymour Hoffman), is trying to upend the schools' strict customs, which have long been fiercely guarded by Sister Aloysius Beauvier (Academy Award winner Meryl Streep), the iron-gloved Principal who believes in the power of fear and discipline. The winds of political change are sweeping through the community, and indeed, the school has just accepted its first black student, Donald Miller. But when Sister James (Academy Award nominee Amy Adams), a hopeful innocent, shares with Sister Aloysius her guilt-inducing suspicion that Father Flynn is paying too much personal attention to Donald, Sister Aloysius sets off on a personal crusade to unearth the truth and to expunge Flynn from the school. Now, without a shard of proof besides her moral certainty, Sister Aloysius locks into a battle of wills with Father Flynn which threatens to tear apart the community with irrevocable consequence.